Introducing the 60-Inch Folding Portable Table Tennis Table for Kids by Harvil. It comes with free accessories, and can be found on Amazon. What makes this product unique is that it can be stocked away in a case and can be transported if you want to play this anywhere you desire. Just make sure that playing ping pong is allowed. Since I have done some reviews on other mini game table products on this site, I have decided to promote a ping pong table product which I have not done a review post as of now. 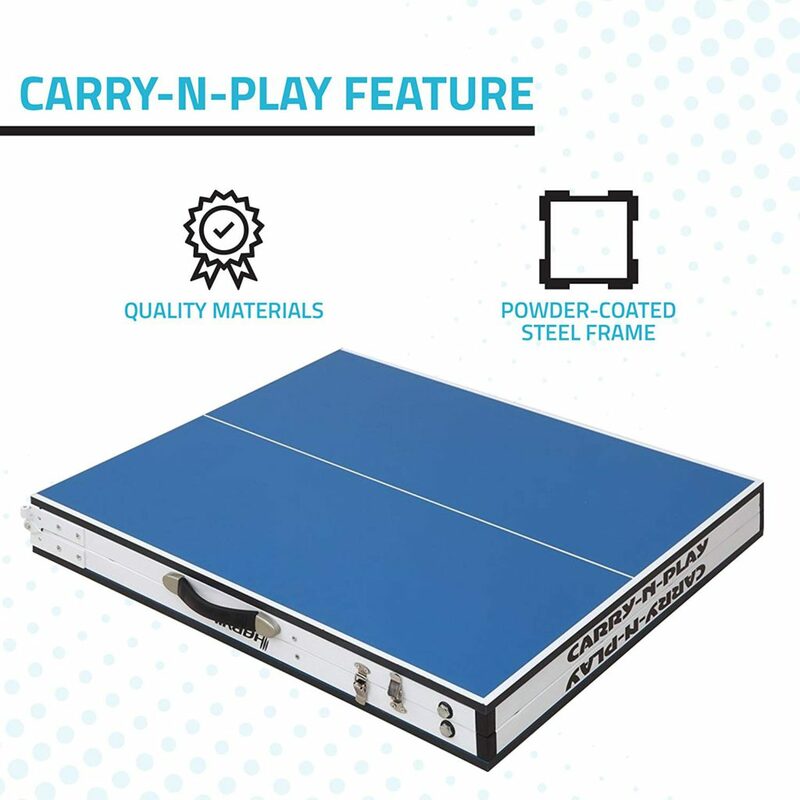 HASSLE-FREE AND VERY DURABLE – Carry-N-Play features sturdy construction: durable top is supported by a powder-coated solid steel frame for maximum stability and excellent playability during matches. 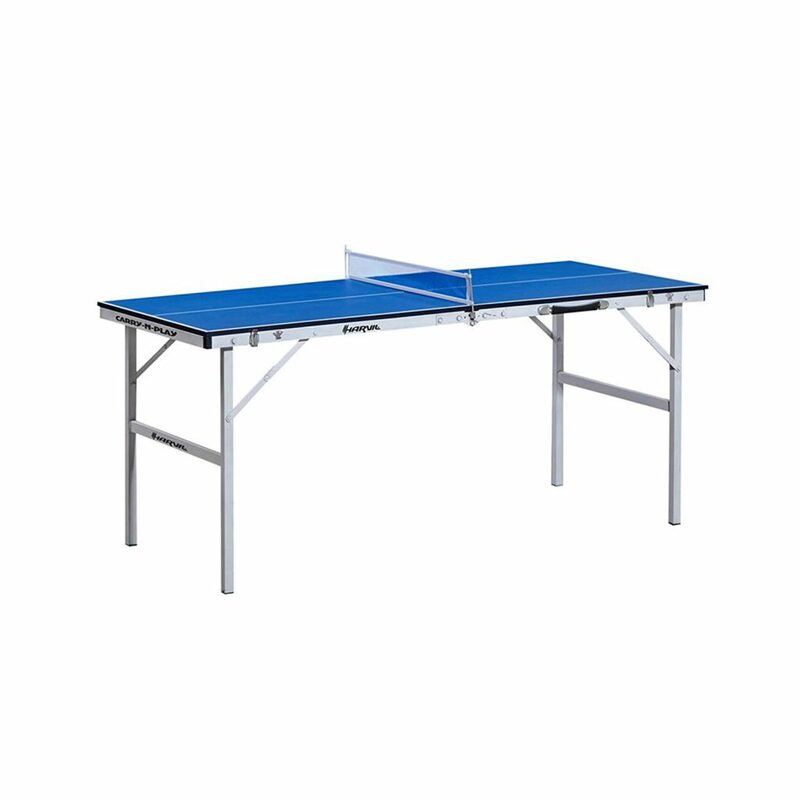 This folding tennis table is ideal for players of all skill levels. PACKED WITH COMPLETE ACCESSORIES – Everything you need comes with this mini table: ping pong net, net posts, 2 rackets, and 3 balls. DAZADI GUARANTEE and WARRANTY – Your table will arrive with all the necessary parts, without defect and/or shipping damage. They’ll ship new replacement parts or an entirely new table at no cost in the event of defect or damage. If you still aren’t satisfied, you’ll get a full refund. Harvil also offers in-home delivery and assembly for an added fee. In the 180-day warranty period, they will repair or replace defective parts at no cost to the purchaser. DESIGNED AND ENGINEERED BY HARVIL – All Harvil items are designed and engineered by creative people right here in the USA. They are a family business where they design their products to be enjoyed by family and friends. Even though many of these items are manufactured in Asia, they understand Americans needs by bringing their items to life. I forgot to mention that this product was rated at 4.0 stars out of 5, and there were 41 customer reviews. Since this product had a carrying case that you can take anywhere, I felt that this can benefit you. I would like to go on the record and say that I played on a similar table to this. I had hours of fun playing on it. My only drawback is that it was too small especially when playing with doubles. If you have kids, they’ll be more than appreciative to play on something like this. I hope that you enjoyed reading this post. You may share this on social media and share what you thought about reading this in the comments box below. I thank you for stopping by, and I’ll see you again in the next post. Cheers!